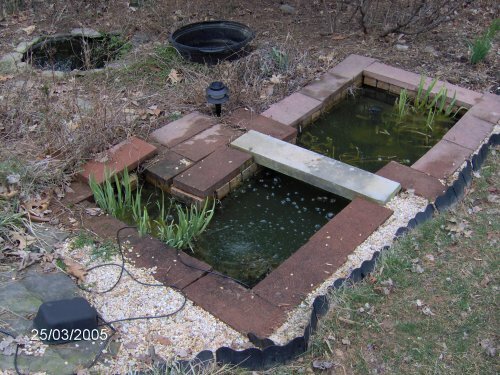 I again cleaned the pond on 3/25/05 and have written the details below. I basically followed the same sequence as previously which you can read above. Below are some comments about things that are different than the above account or specific to it. I started gathering supplies at 8:15 am. Untangling the hoses was painful. I was ready to begin the actual work at 8:50 pm. 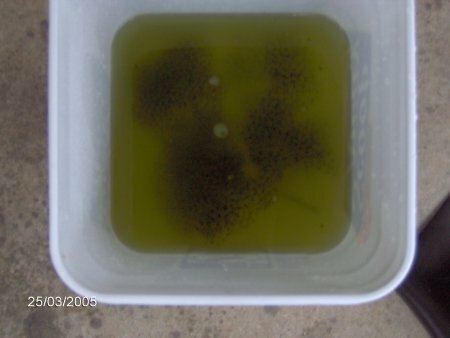 The air temperature was 42 degrees F, and the 153 gallon pond water was at 46 degrees F.
Once ready, the first thing I did was to remove the half dozen bunches of wood frog eggs that were laid on 3/23/05. See my April 2005 newsletter for more information (not on-line until 4/9/05). I took out the de-icer and got to work. I was surprised that most of the submerged plants were gone. I think the green frog tadpoles must have eaten them all. The snails helped I am sure. The pond had a good amount of debris, mostly pine needles and leaves. There were a bunch of earthworms as well including a lot in my empty mesh bags that used to have barley straw in them. I went in for lunch at 12:28 pm as it started to drizzle. I was back outside by 12:51 pm. 10 frogs - I am not positive about all the sexes and species but I believe it was one male wood frog, 3 female wood frogs (one may be a green frog juvenile, not sure), 5 male green frogs, and one juvenile green frog. When I put them back in the pond, they had been in a bucket together, and the male wood frog had latched onto a male green frog! The poor green frog was crying to get free. I tried but could not separate them! Late that night, the wood frog was still latched onto him, dragging him under when he saw me. He must have thought he had caught the biggest female ever (as the male green frog was bigger than any wood frog). I hope he did not hurt the green frog! There was also another male wood frog in my 50 gallon lotus tub pond while I worked that day who kept calling during the day (an added bonus!). 63 rosy red minnows - a few large males, many females, and a lot of juveniles. I actually did count the fish as I found them! I am sure they did not enjoy ending up in drying debris and picked up by me but they all hide in the bottom slop instead of up on top where I could gently bucket or net them. 1 male Southern redbelly dace - hurray! He is still alive! The two red shiners from last year were not as fortunate as I found no trace of them. I took some photos to be put up later. A few hundred green frog tadpoles. A hundred or so assorted small snails. Half a dozen large bunches of wood frog eggs laid two days earlier. There were a few dead tadpoles but no dead frogs or fish that I found. 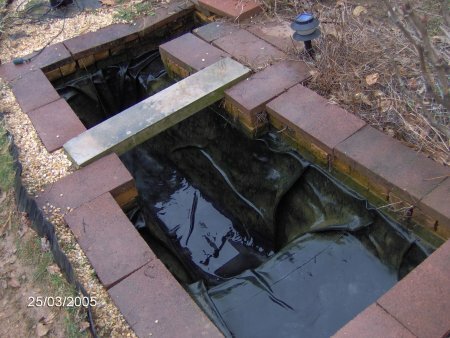 In addition to the 153 gallon pond, I cleaned out the back liner pond and refilled it with water as well. I repotted the plants back into the same pots mostly or ones of the same size. In the deep end went two water lilies in a one and a two gallon. I put a portion of one of those into another one gallon to put into my 20 gallon tub pond. In the marginal area, I repotted the yellow flag iris into a two gallon pot and the sweetflag into a one gallon pot. Both were severely overgrown (even though I did them last year). I just cut an end off that is away from the pot and toss the rest. There were two other one gallon pots of water lilies there as well. The water lilies were not root bound. 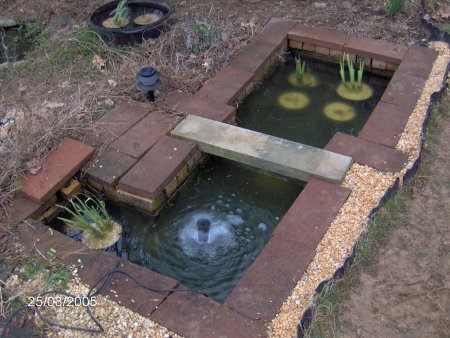 In the overflow, I repotted the iris there (either purple or blue, not sure) into a one gallon pot and another one gallon pot to put in my 20 gallon tub pond. When I was squirting out the two kiddie pools to put them up, I was surprised to find they both had holes in them. This explains the extra mud between them and my pond that made a mess. At least they did not drain out leaving the animals stranded. Everything was put up by 4:30 pm. I then went to the aquarium store where I got some things including anacharis and hornwort. 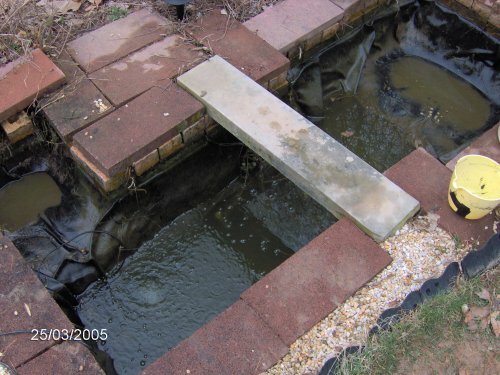 On 3/26/05, I put the 5 anacharis and 2 hornwort in the 153 gallon pond and removed a little bit of both for the 20 gallon tub pond. The green and wood frog tadpoles will munch on them. I hope they leave some to help with the pond clarity and health. While working that day, my new 12 gallon Tricker pond arrived too. I was in pain for days but it is a good pain! All of these photos were taken on 3/25/05.